The holiday season may be underway, but it’s never too late to improve your holiday campaigns. Keep track of your process and performance before the season is over and look for new opportunities to boost holiday success. Even if your campaigns are all dialed in this year, these seven ways to maximize AdWords for ecommerce during the holidays are timeless! Examine Shopping data from last October through February to capture the highs and lows of last holiday season, and to better prepare for this season. The key to growth in any area of business (or life, for that matter) is being able to recognize weaknesses, find solutions, and capitalize on them in the future. During your analysis, look for patterns in your performance data. Does your performance align with your goals? Be a detective— ask yourself questions to understand the cause-and-effect. Download our FREE holiday analysis worksheet for step-by-step instructions on how to setup your Shopping campaigns for success. How did you measure performance last season? 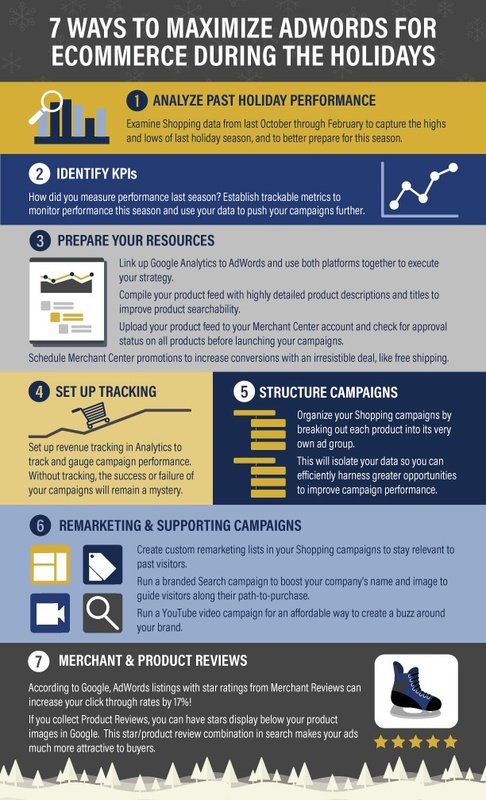 Establish trackable metrics to monitor performance this season and use your data to push your campaigns further. Your key performance indicators are unique to your business goals, but common metrics to measure include: conversions, cost/conversion, mobile traffic, unique site visits and bounce rate. Once you identify your KPIs, keep a close eye on them throughout the season and optimize to stay on top. Consider how outside influences, like retail holidays, are affecting your KPIs. For example, are there a lot of people coming to your site, but few are converting? Perhaps one of your competitors ran a Green Monday promotion that drew potential customers away from purchasing on your site. KPIs allow you to dig deeper into your campaign performance and audience engagement and give you the hard facts you need to make your campaigns better. Link up Google Analytics to AdWords and use both platforms together to execute your strategy. In Analytics, track user interactions with your products to grasp a clear understanding of the relationship between your audience and your business. Use data from both platforms to tailor your campaigns to fit your audience’s needs. Compile your product feed with highly detailed product descriptions and titles to improve product searchability. The holiday season is full of picky shoppers and detailed product information helps a meticulous shopper make an immediate purchase. Don’t give a shopper with intent reason to look elsewhere— be the answer they’re searching for. Upload your product data feed to your Merchant Center account and check for approval status on all products before launching your campaigns. Schedule Merchant Center promotions to increase conversions with an irresistible deal like free shipping. According to UPS, one of most important factors when searching for and selecting products online is shipping fees, weighing in at 79%. Give your audience what they want, and you shall receive. Set up revenue tracking in Analytics to track and gauge campaign performance. Without revenue tracking, the success or failure of your campaigns will remain a mystery. Tracking is to AdWords as Rudolph's red nose is to Santa. Your campaigns will be lost without tracked conversion and revenue data. If you haven’t set up conversion or revenue tracking, don’t panic.It’ll be tough to implement and utilize this season, but It’s never too late to start tracking data so you can gear up for next year and be better than ever. Call our Google Shopping experts to setup your revenue and conversion tracking. Organize your Shopping campaigns by breaking out each product into its very own ad group. This will isolate your data so you can efficiently harness greater opportunities to better your performance. Despite the number of products you have, take the time to break each product into its very own ad group. Creating this kind of granular structure will highlight your top performing products, making it easy for you to capitalize on what you know is working well. Create custom remarketing lists in your Shopping campaigns to stay relevant to past visitors. Remarketing is the best way to keep users engaged with your brand. When a user views a product on your site, a cookie is dropped on that person’s browser so personalized product or branded ads can reach that viewer as they continue to shop across the web. Run a branded Search campaign to boost your company’s name and image to guide visitors along their path-to-purchase. Shoppers want to buy products from brands they trust, and branded Search ads are the perfect platform to showcase what makes your company great and why they should buy products from you. Run a YouTube video campaign for an affordable way to create a buzz around your brand. People search in so many different places on the web, so why not broaden your reach and tap into YouTube’s audience? Afterall, YouTube is the second largest search engine next to Google. According to Google, AdWords listings with star ratings from Merchant Reviews can increase your clickthrough rates by 17%! If you collect Product Reviews, you can have stars display below your product images in Google. This star/product review combination in Search makes your ads much more attractive to buyers. When shopping for rating and review companies, make sure you find one that collects both merchant and product reviews, and that has an existing partnership with Google, Bing and Yahoo, otherwise your ratings won't show up in your Adwords and Product Listing Ads. We recommend working with Shopper Approved to make your holiday less stressful. They have the necessary syndication partnerships and special features that allow you to display merchant reviews on your product pages until you've collected enough product reviews (which comes in handy during the holidays).